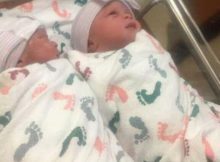 PSquare’s Paul Okoye and his wife Anita Okoye welcomed a set of twins in a hospital in Atlanta. LIB gathered exclusively that the bundles of joy have been named Nathan and Nadia and their igbo names are Obinna and Adaobi Okoye. Massive congrats to them.